The Universe is an incredibly huge web full of mystery. Humans are the most intelligent living being known up to now. That is obviously what most of people would say. How did we get here? Where do we come from? Where are we going? Why were we created? These are all some sorts of questions that remain unanswered. Some people have witnessed things. Things that are remain unsaid. Things that people prefer not to talk about because they’re afraid of the perception society will have on them. There are many persons who lived strange things. Extra-terrestrials, also known as aliens, have created a certain impact among our society. How will we ever know if something really happened in Roswell? Society have made fun and profit out of this kind of subject. I’m one of the persons who cannot believe that we are alone. I cannot believe that in this Universe only Earth contains life. I believe that there is an other form of life that is unknown by man or maybe known but hidden. You might ask yourself why do they hide this? Some persons are very vulnerable. They might get desperate, imagining the worst. Let’s say it’ll bring chaos. Of course, it is understandable not to talk about it but still it is also not correct to deny it. Isn’t it? As you may know, Education in Montreal is having troubles. Students have been on strike for about 14 weeks. My school has been on strike for 2 months. Protesters have made the Minister of Education to quit her job. Students have gone wild though. Well, perhaps not. The thing is that during the protests marches other people, that are not students, come join the mass of people and start riots. And then, the police officers start shooting at students for NO reasons at all. They shoot them while they’re standing in front of the school doors doing nothing but blocking the entrance. The police officers where far to violent for no reason at all. My whole generation is wasting time. The Government doesn’t seem to understand our point of vue. I just hope it ends soon, this whole problem. I hope they finally get to an arrangement and let us go back to school with no preoccupation. What do you guys think? The Universe is full of unknown objects. Some of them contain life. It’s cold, hot, beautiful. Let’s take a shooting star. It travels from who knows where to who knows where. In between its destination, we can see its beauty. It’s bright. How is that? During it’s “journey”, the shooting star enters the atmosphere of an astral object and it leaves dust on its path. Some stars are growing, others are dying. While every star moves and travel there is One that doesn’t move. 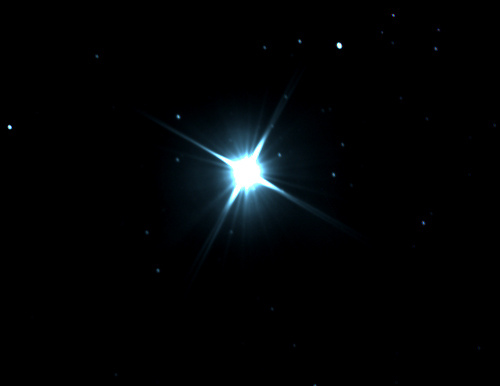 It is know as the North Star. It is also called Qi-am-i Wintok by Native North Americans. It is said that it was one a mountain sheep called Nagah. I know…a sheep, it does sound weird. But! You must not forget that in the Native North American culture, animals are very important. So, this sheep liked to climb very peak mountains and sheer rocks. Nagah liked to climb very high mountains. One day, Nagah saw one mountain that was so high that the apex got lost into the clouds. Nagah finally reached the top and was so glad to finally see the whole world from the top ! Shinob, the Great Spirit was walking in the sky when he saw Nagah on the top of the Mountain. He decided to transform her into a star. A star that will bright in the dark sky and that will be seen by every linking being on the planet. She will be a guide for travelers who travel by earth and sky. This is how, Nagah became the only star that stays in the same position. Obviously, this is a myth, but if you guys are really interested into the actual facts, let me know and I’ll do my best to give the rightful answers to you. OMG….This is unacceptable. Privacy. Secrets. Everyone has the right to poses them.